Wallis Simpson is a woman that people either love or hate. 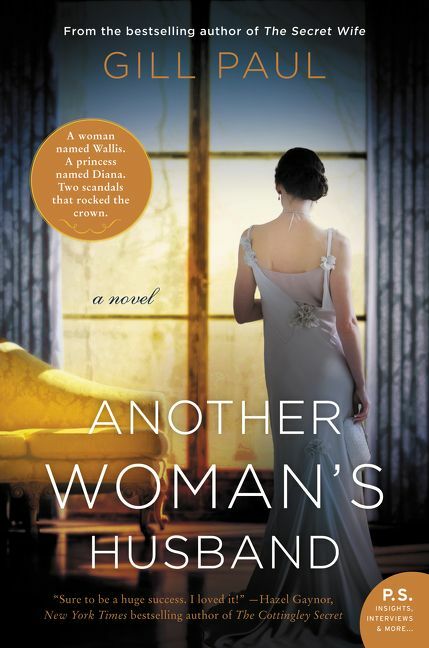 Another Woman’s Husband by Gill Paul explores the relationship between the woman who became the Duchess of Windsor and her oldest friend. I thank TLC Book Tours for sending me a copy at no charge for my honest review. It seems quite popular lately in fiction to write a story with dual timelines with something connecting the two whether it be a book, a piece of jewelry or a castle. In Another Woman’s Husband the connection is a visit that Diana paid to Windsor Villa just outside of Paris on the day she died. That and a small platinum bracelet. The chapters that dealt with the life of Wallis Simpson were far more interesting to me than the ones that took place in the more modern era – although Diana did die 21 years ago so that is certainly “historical.” Just not enough so for me. It’s still just a little too much a part of my reality. This preference for the older sections is typical for me. I found the story of Wallis and her long time friend, Mary fascinating. This was a friendship forged early in their lives that stayed strong – as long as Mary performed her role and didn’t take from Wallis. Only Wallis could take and shine. As I noted above, people tend to have very strong feelings about Wallis – I for one don’t think very highly of her and this book did nothing to change my opinion. If anything it solidified it. The story that takes place in the present about the relationship between Rachel and Alex was nothing extraordinary. In truth I found that much of it just didn’t ring true for me and I was just reading through to get to the parts about Wallis and Mary. That was what the book was for me. The relationship between these women was the driver of the story and what I wanted to read. The rest was fluff. I am sure others will disagree with me and that is the beauty of reading. This book is delightful for the story of Wallis and Mary. Even if Wallis drove me to distraction – I expected that, she just is that kind of woman.